The sea as plays a big part in the of history of this area. 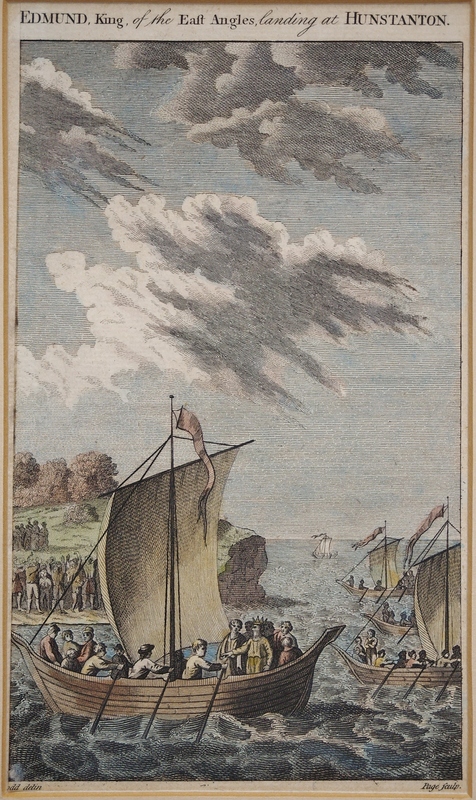 The first etching portrays King Edmund as he comes ashore at Hunstanton in East Anglia. Edmund landed on Hunstanton beach in 855AD. This son of a German King, Edmund, then aged 14, claimed his kingdom, East Anglia, and reigned peacefully for 14 years until the invasion by the Vikings. King Edmund was a Christian and believed he was called to pacifism so would not wage war against the Vikings. The Vikings scoffed at Edmund’s faith, tied him to a tree and whipped him. Edmund continued to call out to Christ. This enraged the Vikings even more and they decided to fire arrows at Edmund. When finished he was covered with arrows much as a hedgehog has bristles but still he called on Christ. Angered even further the Vikings beheaded Edmund. The tale has it that his head was discarded in the forest but found by his searching friends guarded by a wolf, untouched. He was buried but later exhumed to be re-interred at Bury St. Edmunds. Upon exhumation it was found that the wounds from the arrows had healed and that his head had reattached to the body although a thin scar could be seen circling his neck. King Edmund became the first patron saint of England. The etching is a small 4.25″ by 7.5″. Next comes a recent find which is very nautical indeed. The etching was done by David Law (1831-1901) one of the foremost etchers in Britain in the 1800’s. He was an etcher and landscape artist. He was born in Edinburgh, moved to London in the 1850’s and became a founder of the Royal Society of Painters, Etchers, and Engravers in 1881. David Law spent 20 years as a map engraver for the British Ordnance Survey. As a watercolourist, he painted landscapes, detailed scenes of ships and architectural subjects. His etchings of the paintings of Turner and Corot are well known, but it is with etchings of his own work , such as his series of British castles, that he found real and justifiable success. The scene as the fleet passed out of the harbour must have been singularly beautiful. It was a treacherous interval of real summer. The early sun was lighting the long chain of the Gallician mountains, marking with shadows the cleft defiles, and shining softly on the white walls and vineyards of Coruna. The wind was light and falling towards a calm; the great galleons drifted slowly with the tide on the purple water, the long streamers trailing from the trucks, the red crosses, the emblem of the crusade, showing bright upon the hanging sails. The fruit boats were bringing off the last fresh supplies, and the pinnaces hastening to the ships with the last loiterers on shore. Out of 30,000 men who that morning stood upon the decks of the proud armada, 20,000 and more were never again to see the hills of Spain. This etching is an amazing 19″ by 29″. Superbly etched and wonderfully coloured, it well deserves a wall all to itself, but my house is small and it may have to share a place. 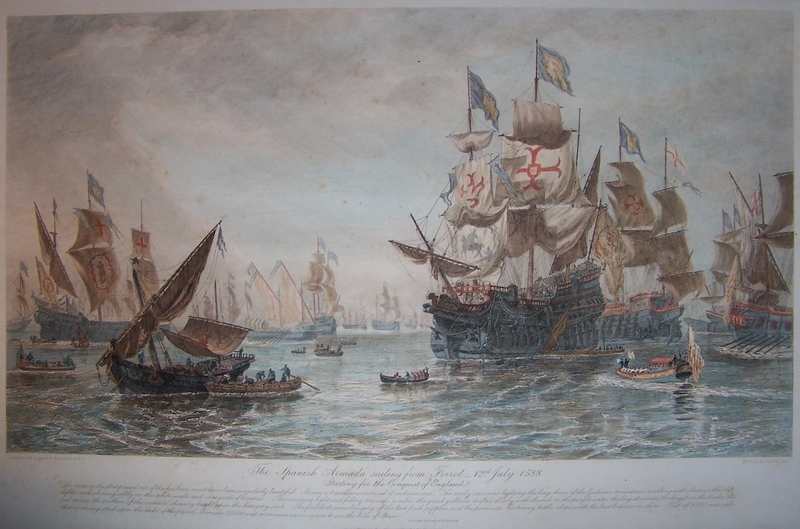 This entry was posted in Etching and tagged beach, boats, cliffs, David Law, Ferrol, flotilla, Hunstanton, King Edmund, masts, oarsmen, Oswald Brierly, rigging, rowing, sails, seamen, ships, Spanish Armada. Bookmark the permalink.